Finally Friday – What’s Cooking? This week’s card was inspired by product packaging. Can you believe that? :) So fun! And I love the cute What’s Cooking? stamp set from Hero Arts. It’s perfect for all you cooks out there and the apron is so cute! The paper I used is Cosmo Cricket’s Early Bird collection, which I can’t get enough of! I keep using it on everything! This is the first project of many that you’ll see with this paper. I love it so SO much! Anyhow, enjoy the video. You can catch it out at YouTube as well. Thanks for watching! Blogger, designer, calligrapher, letterer, and paper lover! If it's paper, I'll probably love it. Hi! I'm Kristina! 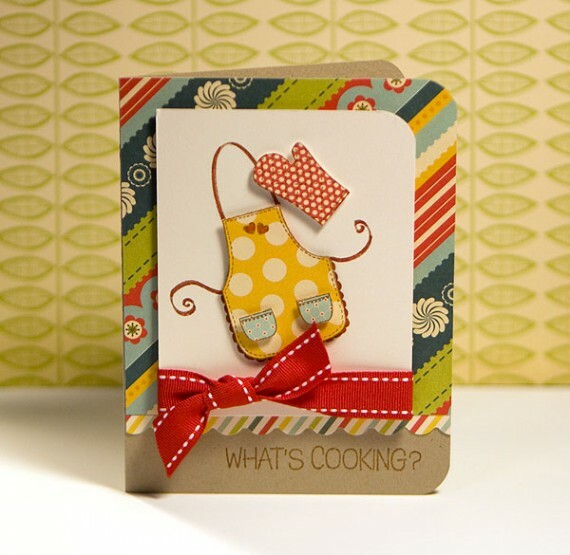 Welcome to my blog for all things crafty and card related. I'm a blogger, designer, and enthusiastic paper lover. I send out random giveaways with crafty goodies! If you’d like to enter my monthly giveaways, just fill out the form HERE. You will also have a chance to submit your mailing address for Mail Art consideration when you fill out the form. NOTE: There is a new form every month. This keeps all of the mailing addresses up to date. Thanks! • Personal learning and crafting = okay. If you share on a blog or in a gallery, please link back to K Werner Design Blog as the source of inspiration. • Selling cards made from my designs = not okay. If you're unsure, please contact me. All opinions are my own. If I receive a product to review, it is my policy to make note of how it was acquired. That being said, I only recommend products I genuinely use. I do not accept offers of direct payment for dedicated blog posts to promote products. I belong to the following affiliate programs: Simon Says Stamp and Amazon. Compensated affiliate links are used when possible.